This weekend we finally got around to hitting the SoWa Open Market. The market features antiques, music, art, handmade gifts and food. If you live in Boston and have not been yet you should definitely check it out. It is such a nice way to spend a lazy Sunday afternoon. Here are a few vendors I visited. I have already spotted items I want from each place. JHillDesign-Here is just a small sampling of the prints available at JHill Design. You can even customize any JHill print with your own text, pattern, and location. (This is the option I am going to go with when I get around to ordering a few prints) Check out the website for all the other services they offer such as invitations, calendars, and other personalized gifts. I also stopped by and chatted with the lovely ladies over at mitetees. They have all kinds of personalized gifts to choose from. But, my favorite was the Production Series. These onesies make great gifts for your friends who are expecting babies or already have little ones. In fact, my brother and sister in law are going to have a baby boy and I am already thinking I need to get a personalized onesie for the baby. 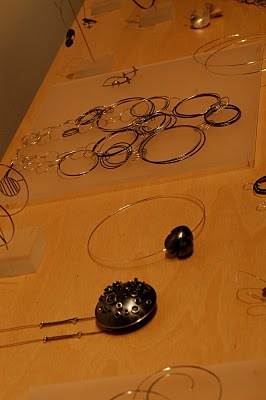 Finally, I had a chance to meet with Melissa of melle finelli jewelry. Melissa has a beautiful collection of rings, earrings, and necklaces. Here are a few shots from the studio. In celebration of Father's Day we tried Gaslight in the South End for the first time. This is one of my new favorite spots in Boston for Brunch. The great thing about Gaslight is that it's right around the corner from the SoWa Market. Oh I really miss living in the South End! Poor Ariyana was a little sick this weekend so we spent some time cuddling in bed, sipping orange juice, reading Olivia, and watching way too much Dora.